St. Josemaria Escriva was born in Barbastro, Spain, Jan. 9, 1902. He was the second of six children of a devout family. In 1904, Josemaria was gravely ill and the doctors gave up on him. However, he was cured unexpectedly; his parents attributed the cure to the intercession of Our Lady of Torreciudad, and took him on a pilgrimage of thanksgiving. Josemaria’s three sisters died in 1910, 1912, and 1913. His father’s business failed in 1914. These tragic events taught Josemaria the meaning of suffering and brought him to maturity. The family moved to Logrono, where his father had found new employment. He intuited that God wanted something of him, although he didn’t know exactly what. He decided to become a priest in order to be available for whatever God wanted of him. In 1918, he began his studies; he was ordained March 28, 1925. On Oct. 2, 1928, while he was on retreat in Madrid, Father Escriva was inspired by God to found Opus Dei, an institution within the Catholic Church dedicated to helping people in all walks of life to follow Christ and to seek holiness in their daily lives. In 1930 Father Escriva started Opus Dei (the two Latin words mean “Work of God”) for women, making it clear that they had the same responsibility as men to serve the Church and society. While celebrating Mass on Feb. 14, 1943, Father Escriva was inspired to found the Priestly Society of the Holy Cross. On June 25, 1944, three members of Opus Dei were ordained priests. Father Escriva moved to Rome in 1946 and became the driving force behind the spreading of Opus Dei around the world. In 1948 full membership in Opus Dei was opened to married people. On June 16, 1950, Pope Pius XII granted definitive papal approval of Opus Dei. In 1951 Father Escriva consecrated the families of Opus Dei members to the Holy Family. He also consecrated Opus Dei to the Most Sweet Heart of Mary. During the 1950s, in answer to the needs of the world, he promoted universities, training schools, agricultural colleges, hospitals, and clinics. During the Second Vatican Council (1962-1965), the council fathers sought the advice of Father Escriva on themes such as the universal call to holiness and the function of lay people in the mission of the Church. In 1969 Father Escriva travelled to shrines of Our Lady, praying for the Church and for world peace. He visited the Marian shrines of Lourdes, Sonsoles, El Pilar, La Merced, Einsiedeln and Loreto. Between 1970 and 1975 Father Escriva undertook catechetical trips throughout Europe and Latin America, teaching Christian doctrine and Christian living to many people. Father Escriva died in his office in Rome June 26, 1975. He was beatified by Pope John Paul II May 17, 1992, and canonized by him Oct. 6, 2002. This entry was posted in Lay Organizations, Saints & Blessed on December 2, 2013 by fatheranthonyho. In 1924 Dorothy bought a property in the New York borough of Staten Island. She started to live common law with Forster Batterham, who was anti-religion and anti-marriage. Dorothy’s growing interest in Catholicism often led to quarrels. Unexpectedly, Dorothy discovered that she was pregnant. Despite the opposition of Forster, Dorothy kept the child and had her baptized in a Catholic church. After breaking up with Forster, Dorothy herself was received into the Catholic Church on Dec. 28, 1926. In May 1933 the first issue of The Catholic Worker was printed. By December, 100,000 copies were being printed each month. The paper didn’t merely complain but called on its readers to make personal responses. Eventually the editors of the paper started to welcome poor and homeless strangers, and by 1936 there were 33 Catholic Worker houses spread across the U.S. The Catholic Worker movement supported works of mercy, but not works of war. In 1965 Dorothy went to Rome to take part in a fast, praying that the Second Vatican Council would issue a clear statement against war and violence. In December, the Constitution on the Church in the Modern World was approved by the bishops. The council described as “a crime against God and humanity” any act of war “directed to the indiscriminate destruction of whole cities or vast areas with their inhabitants.” The council called on states to make legal provision for conscientious objectors while describing as “criminal” those who obey commands which condemn the innocent and defenceless. Dorothy died on Nov. 29, 1980. Cardinal John O’Connor of New York launched the canonization process in 1997, the 100th anniversary of Dorothy’s birth. This entry was posted in Lay Organizations on December 2, 2013 by fatheranthonyho. In October 1926 Marthe spent three weeks in a coma. She experienced three apparitions of St. Therese of the Child Jesus. The saint revealed to her that she would not die yet, but recover and extend her mission throughout the entire world. On March 25, 1928, Marthe’s legs became completely paralyzed. Henceforth she was bedridden for life. From 1928 to 1981 she experienced the grace of total abstinence from all food and drink, and she did not consume anything except Holy Communion. In addition to her absolute fast, she entirely ceased to sleep. On Feb. 2, 1929, Marthe lost the use of her hands, which she had offered to the Lord. She learned to write with a pencil in her mouth. She remained in an uncomfortable and unchangeable position, without drinking, without eating, and without sleeping, for more than 50 years. Towards the end of September 1930, Jesus appeared to Marthe and asked her, “Do you wish to be like Me?” Marthe consented to the request of Jesus. In early October Jesus appeared to her and gave her the stigmata. She bled from her hands, her feet, and her heart. Later Jesus imprinted His crown of thorns on Marthe’s head. On the Friday after receiving the stigmata, she began to relive the Passion of Jesus. People started coming to see her. The apostolate of welcoming visitors would continue for 50 years, until the end of her life. A visitor would wait in the kitchen in the company of Marthe’s mother, then enter her room and chat with her. Marthe would send the gifts given to her by visitors to the poor and to missionaries. Marthe suffered in her body. She suffered great physical pain each time the bed linen had to be changed. She suffered in her heart to see that her parents were tormented by not being able to do anything for her. Above all, she suffered in her soul because of the sinfulness and lukewarmness of mankind. Every week Marthe relived the Passion of Christ, beginning with the agony on Thursday night. The torment continued from Thursday night throughout the whole of Friday. She relived all the scenes of the Passion. Marthe was inspired to build a Christian school for girls. Most of the priests thought the idea was “crazy” because the area was dominated by freethinkers. It took two years for Marthe to convince her spiritual director to take the first step for the project. Finally, on Oct. 12, 1934, the Chateauneuf de Galaure school was opened. Today there are two secondary schools and an agricultural school, with a total of about 1,000 students. Another project Marthe was inspired to undertake was the “Foyers de Charite” (Houses of Charity). They are retreat houses built and organized by consecrated lay people and directed by a priest. The first retreat took place on Sept. 7, 1936, preached by one of Marthe’s close friends, Father Finet. By 2006 there were 75 Foyers in 41 countries. After 50 years of suffering in union with Jesus for the conversion of souls, Marthe died on Feb. 6, 1981. 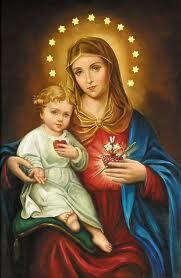 “Oh Virgin Mary, let me each day be more docile, more patient, more simple; unnoticed and forgotten. I do not ask that God bring about in me things that are visible, but only that I be a small, lowly child, sweet and humble of heart,” said Marthe. Catherine de Hueck Doherty was born in Russia on Aug. 15, 1896. At the age of 15, Catherine married Boris de Hueck. During the Russian Revolution, many of her family members were killed. After narrowly escaping death, Catherine and Boris became refugees and came to Canada in 1921. Their son George was born the same year in Toronto. Catherine worked hard to support her ailing husband and child, but after years of painful struggle, her marriage to Boris fell apart. Eventually Catherine’s marriage with Boris was annulled by the Church in 1943. On Oct. 15, 1930, Catherine made the decision to give her life to Jesus. She marked this as the day of the beginning of her apostolate. Catherine sold all her possessions and provided for her son. She started to live in the slums of Toronto, and began her lay apostolate among the poor. Young men and women came to join Catherine. She established Friendship House, and lived the spirituality of St. Francis of Assisi. It was the time of the Great Depression. Members of Friendship House offered hospitality and provided material assistants to the poor. They also combatted the tide of communism through lectures, discussions, and the distribution of “The Social Forum” newspaper, based on the social encyclicals of the Church. False but persistent rumours about her and the Friendship House forced its closure by churchmen in 1936. During the Christmas season in 1936, Catherine was tempted to suicide. However, she heard the voice of Christ beckoning her to share His suffering. Catherine left Toronto, and was invited by a priest to open a Friendship House in Harlem. Catherine accepted the invitation in 1938. In 1943, after obtaining the annulment of her first marriage, Catherine married a widower, Eddie Doherty, a journalist who had fallen in love with her while writing a story about her apostolate. The Friendship House in Harlem also ended in failure. Divisions developed among the staff, and in January 1947 they out-voted Catherine on points she considered essential to the apostolate. Seeing this as a rejection of her vision of Friendship House, she stepped down as Director General. Shattered by the ordeal of Friendship House, Catherine came to Combermere, Ont., with Eddie on May 17, 1947, intending to retire. However, as Catherine was recovering from the trauma, she began to serve those in need in the Combermere area. She and Eddie established a newspaper, “Restoration,” and a training centre for the lay apostolate. Again young men and women asked to join her. On April 7, 1954, those living in Combermere voted to embrace a permanent vocation with promises of poverty, chastity and obedience, and the community of Madonna House was established. The next year, Catherine and Eddie made a promise of chastity and lived celibate lives thereafter. On Aug. 15, 1969, Eddie was ordained a Catholic priest in the Melkite rite at the age of 78. The spirit of the Madonna House is that of a family, modelled on the Holy Family of Nazareth, which was a community of perfect charity and love. Members of Madonna House are involved in theology, philosophy, special programs, publication, science, fine arts, drama, farming, carpentry, cooking, and laundry. Catherine died on Dec. 14, 1985, after a long illness. She left behind a spiritual family of more than 200 members, and foundations around the world. This entry was posted in Lay Organizations on November 4, 2013 by fatheranthonyho. Last week we looked at the life of Blessed Chiara Luce Badano, who was active in the Focolare Movement. This week we are focusing on another Chiara, Chiara Lubich (1920-2008), the foundress of the Focolare Movement. She was born in Trent, in northern Italy, on Jan. 22, 1920, and was baptized with the name Silvia. In 1939 Chiara visited the Marian Sanctuary of Loreto and there discovered her special calling. She would found something new in the Church, a “focolare,” a community of people consecrated and married, all totally committed to God. On Dec. 7, 1943, Chiara committed her whole life to God with a vow of chastity. In May 1944 Chiara started to live with four of her first companions at a small apartment offered to her, which she would call “la casetta” (the little house) in memory of Loreto, and the “Focolare” was born. In 1948 the first men’s focolare was opened in Trent. Chiara also met Igino Giorgani, a father of four, who would become the first married focolarino. Starting in 1949 Chiara had a yearly retreat with her companions. This annual gathering of the Focolare Movement is known as a “Mariapolis” (City of Mary). Members and newcomers come together to discuss the movement and its spirituality, forming a temporary town with only one law, evangelical charity. In 1953 Chiara launched the branch of the “married focolarini,” and in 1954 she formed the branch of the diocesan priests and that of the religious men and consecrated women who adhere to the spirituality of the movement. In 1962 Chiara visited a Swiss abbey where she had the idea of having ‘little towns’ inhabited by the people of the Focolare Movement. A young man, Vincenzo Folonari, donated all his wealth to the Focolare Movement, including a large tract of land in the hills near Florence. This donation allowed the building of the first little town or permanent Mariapolis, Loppiano. Loppiano currently has a population of 900 of whom 70 come from the five continents. Each year about 40,000 people visit Loppiano. There are 32 little towns of the Focolare Movement around the world. In 1967 Chiara founded the Gen Movement (New Generation), the youth branch of the Focolare Movement. It was this branch that Blessed Chiara Luce Badano (1971-1990) belonged to. Dialogue with people of other religions is the charism of the Focolare Movement. During her life, Chiara Lubich met and dialogued with Lutheran pastors, the Primate of the Church of England, the Ecumenical Patriarch of Constantinople, and the Supreme Patriarch of Thai Buddhism. She shared the spirituality of unity by giving addresses to non-Catholic Christians, Buddhists, Muslims, and non-believers. Chiara died on March 14, 2008. Thousands of people attended her funeral Mass on March 18 in the Basilica of St.-Paul-Outside-the-Walls in Rome. There were politicians and representatives of other faiths. “We should live in such a way that in our last hours we will not regret having loved too little,” said Chiara Lubich.